Philosophers have long pondered whether street food served inside can still be called "street food", though Taco Bell is still considered "fast food" even though it isn't really food at all, so whatever. 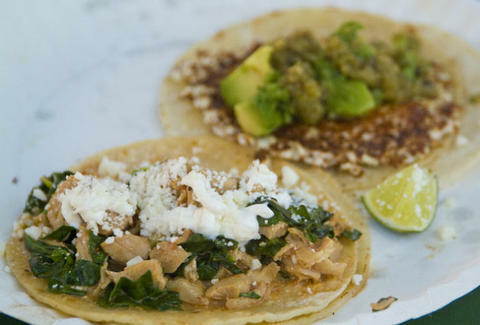 Bringing street food indoors and standing by it: Pinche Tacos. The popular food truck's just now opening their first restaurant, where they're pairing much-loved "street tacos" with small-batch tequila & whiskey in a 70-seater that's kept the original floors and brick walls from its start as a hotel in the 1800s, back when it had to compete with Only Western. Besides a tasty pork belly, the slew of never-before-available tacos leans heavy on the sea, with a "Surf-n-Turf" stuffed with fried rock shrimp and beef tongue, a pan-seared scallop verde with "garlicky" roasted tomatillo, and a shrimp/scallop joint with Yucatan-style pico & habanero called "Nxic-Pec", which translates to "dog's nose", as it "makes a dog's nose run", though hopefully not faster than you, because you want to get to that taco first. Other newness includes three breakfast tacos: one with chorizo/scrambled eggs/potato, one called "pinche hash" with carnitas/caramelized onion/green chili hollandaise/eggs, and another with grilled cotija cheese, roasted tomatillo salsa, and "bricklayer eggs", so there must've been some left over after JR Smith's breakfast. Though they're still locking down all the tequila and whiskey details, they do know they'll mostly feature "mom and pop producers", and'll make available flights for each, so by the end of the night, the only one philosophizing about stupid questions will be you.